Northern England has lead Europe in terms of growth in club numbers over the past few years - whilst in 2006 the Manchester Mozzies were the only club further north than Nottingham, there are now eleven sides taking the pitch in season 2009. Of those, the Mozzies, Liverpool Eagles, Leeds Bombers and Huddersfield Rams are situated in an area measuring around 100km from end to end, with the clubs to form the nucleus of the new ARUK Central competition. The Rams have already made a strong first impression, taking an almost all-English squad to the recent Cardiff Clwb Challenge and putting in a very solid effort in all their matches. This weekend will see them travel to Newcastle for the first ARUK National club tournament, eager to prove they are the real deal. Rams founder Karl Haigh gave us the following report on the development of the team from its inception last December up to the present. Haigh is very optimistic of the Rams' chances for the Newcastle tournament, saying "We can't wait for this weekend as we are going to have an even stronger squad than what we took to Cardiff, as a lot of players that are committed to rugby and soccer are available now as the seasons that have over-run due to bad weather have now ended." "I have got a feeling we are going to walk away with something this weekend! When we played against the AFL teams in Cardiff we didnt once get turned over, all the games were very close." "I started the team in December after hearing about ARUK on the radio. I got in touch with Brian Clarke because I just wanted to play and he said the nearest teams were Manchester or Leeds, which are close but a bit of a mission to get to every week. So I just went for it, I got a massive write up in the local press and let everyone around know what my plans were and got a great response." "I have got the Rams affilliated with the Huddersfield rugby union club after endless meetings and phone calls, but my persistence has paid off as we are going to be the envy of the ARUK and AFL Great Britain teams as our club and facilities are amazing, check out HuddersfieldRugby.com and you can see for yourself. It couldn't have happend at a better time as the rugby club is in its Centennial year." "On the 6th of Febuary I became a dad for the second time and also got a great phone call the same day from an Aussie called Neil Morrison, who had heard about the Rams and wanted to get involved on any level. Neil is an amazing guy and has helped me out no end. He is now the coach and also the secretary of the Rams so it speaks for itself, he used to play back home in Melbourne and played a high standard all his junior and early senior years before he got injured." "Neil is currently the only Aussie in the team as we are all total novice pommes which i am also quiet proud about as its is now a British game also, unlike our good friends the Manchester Mozzies who have quiet a few Aussies playing. We have a great relationship with these guys as we sometimes go over there to train and visa versa. 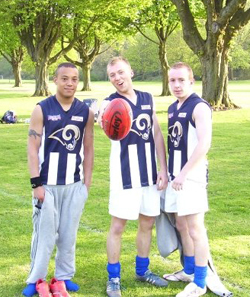 Top guys, Kat Wheeler is a saint and has given me so much advice - we love her at the Rams." "We have just shot a documentary type programme with the BBC which will be ready for the screen in a couple of weeks hopefully,which should give us some good publicity and raise the profile of the game, I will put all links on our face book page so please join the group. Hopefully this will help us with our plans - which are to get junior grass roots footy going at the Rams next season. "We currently are working with the local school PE departments to try and get Aussie rules on the curriculum, we have done a teachers inset where a few head of years have been shown the basics of the game and have taken it away to work on in their own classes. This is a work in progress - we want to focus on this more next year, but we are really excited about it, as the future successes of any team needs a good grass roots basis." "I got the idea for the team name from our Huddersfield coat of arms which is Three Rams, and our colours are closely associated with our soccer club but also contain the gold of both our league and union rugby teams. The logo was chosen for us, which I have now had brought to my attention that it closely resembles the St Louis Rams in America - but we didnt know this before the designs for the jumpers had gone to print so it's too late now. Although we havent had any complaints at all, so no news is good news! We have a great kit and has already been road tested in Cardiff with a great response, we look great as a team in the local papers." "We have a lot of great players in our team... we have some top lads and that's not just my view, that has come from some very good and experienced players and coaches down in Cardiff. One of the biggest things that has attracted me to the sport is the chance to represent our country - it's a massive carrot to any newcomers. We definitely have some very strong contenders for the Dragonslayers or even the Bulldogs and I would love to have the chance myself at going for either team, seeing as I have gone to this length just to get a game! I could name my whole team as stars to look out for, but that's only natural as I am biased and so proud of my lads and think they are great." "We have great expectations for this season, which we will be playing in the ARUK national league against some good experienced sides. We are going to cause some shocks this season I'm sure! Keep watching this space and hopefully we will get out to Oz to give some of your teams a run for your money in this great game you have given to us." WFN thanks Karl for his time - to find out more about the Huddersfield Rams, visit their website at HuddersfieldRamsAussieRules.com.